Shorty's Sutures: She got me! I've been tagged to dish out six random facts about myself that you probably don't know. I sort of played this game not too long ago in a one-sided way.... I didn't get tagged, but I posted some randomness about myself hoping that readers would post their random facts in my comments section. I'm hoping I'll get some of you to play along, although I don't feel right about tagging anyone since I just tagged some bloggers last week with my Smile Award post. 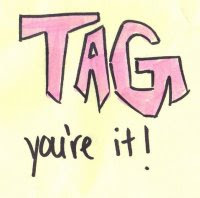 So, if you've been tagged twice by me recently and I'm annoying the crap out of you.... I apologize. Please forgive my affection for these little blog games at the moment! I'm sure it will fade and you will not be troubled much more by me in the future! I believe there is life on other planets! Ok, there...I said it to more than just my son. I just can't see how God could create our planet, our solar system and the entire universe and let us be the only living things running around in it. Now, I'm not pyscho about the issue and I don't believe that I'll ever be abducted by aliens or anything, but hey....there's gotta be something out there other than us! I eat turkey bacon almost every morning of the week...two slices. Hey, gotta have my protein! Cassy, Ginette, Purge, Lyndsay, Specialtypants, and Love-Drunk Mommy. Our leaders....would the military hire them? On a Happy Halloween Note! Oh the things I dream! Poverty.....what is it to me?